You don’t have to read The Mortal Instruments series first, but I think it helps. Tessa Gray is an orphan on her way to London to be with her older brother when she’s kidnapped by a couple of women calling themselves Dark Sisters. They force her to wake up a latent power she has, called Changing, saying they’re prepping her for the Magister. She manages to escape with the help of a couple of Shadowhunters — Will Herondale and Jem Carstairs — who take her back to the Institute in London. Where Tess learns about the whole Shadowhunter world, and the fact that no one knows quite who she is. Oh, and that the Magister isn’t going to give up looking for her. There’s more to this — of course there is — including a wicked cool twist I didn’t see coming. 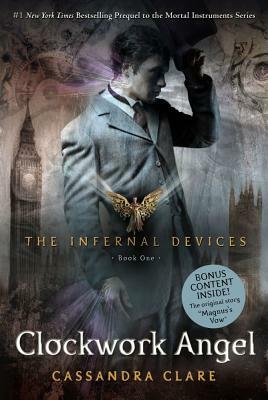 I enjoyed seeing the Shadowhunter world from the perspective of Victorian London. And the smattering of steampunk with the automatons was a nice touch. In fact, in many ways, I liked this one better than the Mortal Instruments. It’s funnier, it’s more intense, and it’s got a more interesting plot. Oh, and Tessa is a WAY better heroine than Clary. Sure, it’s kind of confusing: you never find out what Tessa is, or why the Magister wants her. And the beginning leaves your head spinning. But the end is completely worth it. I agree! I liked this prequel better than the original Mortal Instruments series. I just finished Clockwork Princess and can't stop thinking about it. It has a great ending. Makes me want to re-read them all over again now that they are all out in a few months.